The problem with committing to finishing everything I have ever started and left incomplete is that I don't get to start anything new. (unless of course I drop the old project, start a new one, abandon that one and go back to the old stuff, which now includes the new stuff that I started and didn't finish and so now that is old stuff too......right? Whew......) Alas, fear not dear followers as all is not lost on my quest to eradicate procrastination from my life. With the help of this blog and encouragement of friends, I am learning to not "give up" so easily but to fight through the boredom and carry on. Take this blue baby sweater for instance. I bought the bamboo/cotton blend yarn to use for something else ages ago. 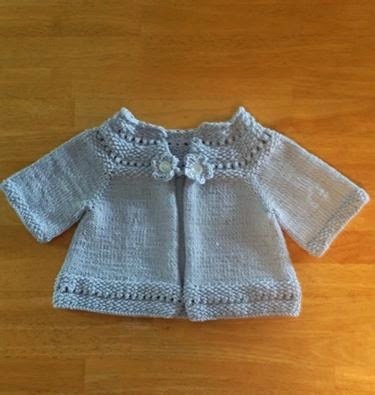 When I heard my friend was going to be a new grandmother I dug it out and began knitting this sweet little sweater. My problems began almost from the first knitted stitch and continued to the last. For starters the pattern was hard to understand, the bamboo yarn was slippery and I dropped stitches along the way. I pulled out and re-knit the blasted thing a million times. To add to the mayhem, many of the stitches split and looked messy and I lost count. I admit that I tossed the partially knit sweater to the back of the closet a few times happy to forget it. But then I saw my friend. She was so excited about becoming a grandmother and was counting the days until the birth. Shamed I went home and I finished it, yes finally.. Here it is. Does one sleeve look bigger to you than the other ? This is adorable! Congrats to your friend. A very lucky baby-to-be indeed. Jackie, you're an inspiration! Keep up the great work! I love your little baby sweater and your friend will love it! We can't help being perfectionists! Take care and have a wonderful 4th of July! I missed you! I love your little sweater, Jackie. Statistically, a person has one arm longer than the other...so I think you're good to go. Happy 4th. Hope Arthur doesn't ruin your holiday plans!